I have now a vintage Jeep in my garage and the last time I used it was sometime 2-years back. I don't have the picture of it right now, but it looks exactly like the one you posted here with a little bit faded military color. It has a 1944 GPW body and use to have its original engine but unfortunately the engine block got broken which forced me to replace it with a very good 1952 MB engine. I'm not really sure yet of selling it but perhaps with a good offer it might be able to help me decide. Now, considering the stocked knowledge that you have about JEEPS over the years,I wish you guys can help me out to find answers to my doubts on whether to sell it or not...ok? Thanks! Larry's Comment: Hector...without photos of your Jeep I'm not sure you will get many replies. Also, since you are in the Philippines, it might be difficult for most readers not in or near your area to make a deal. You might want to advertise locally or on ebay.motors to see what offers you can receive. However, readers of your post here may be interested and can post comments and/or questions. 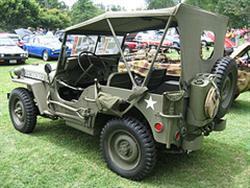 Comments for Do You Want a Willys Jeep Now? Larry, thank you so much for your early response. I really appreciate your kind effort to comment on my page. Actually, I'm still here confined in the hospital, but will sure post a pix of my vintage Jeep as soon as I get back on my feet again..ok? Larry's Comment: Get well soon Hector. Halo Hector...I think you were Zeny's friend. If right, I rode your Willys years ago (1989 if memory serves me right). How much are you selling your willys? Please email me at zxner@yahoo.com. Thanks.